Sites like Thingiverse offer ways for 3D makers to display and upload their 3D models for the world to peruse but there’s never been a way to really “see” the models in real space. That’s where Sketchfab comes in. This WebGL-based tool allows 3D modelers to show almost any object in full, glorious 3D with full vantage control. 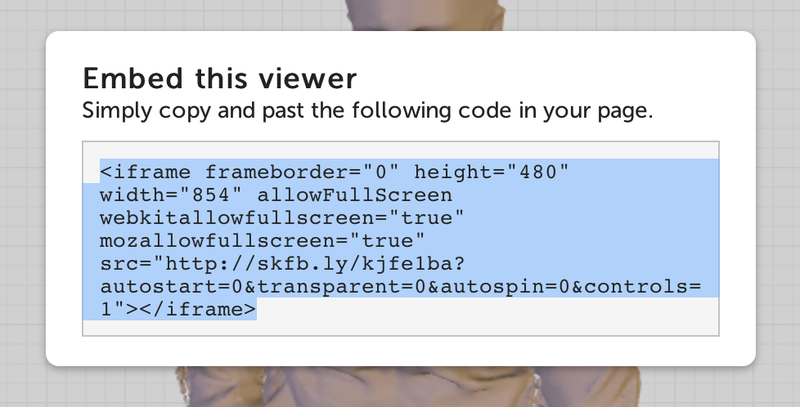 It even allows you to embed 3D content into web pages. The founders, Cédric Pinson and Alban Denoyel, have extensive experience in realtime 3D modeling. The project is self-funded and they currently have 2,300 models uploaded to the site. 3D artists can upload models in just two clicks. “The genesis of the project was to provide a service for 3D artists to show their work. It as become a lot wider, since we now have architects, designers, 3D scanners, etc… using it. Some e-commerce websites are starting to use it as well,” said Pinson. The service is currently free and you can upload multiple file formats including Blend, 3DS Max, and SketchUp. For example, you can grab stuff from Thingiverse and simply import it into Sketchfab to see it in action. This is an .stl file I just uploaded and it works perfectly. The site depends on WebGL to render the objects. They also offer a pro upgrade that gives you more space and private sharing of models. Viewing 3D content is important. It lets e-commerce thrive and as 3D printing becomes more popular it will be fascinating to be able to literally walk through 3D printed products before you spend the time and resources to produce them. Sketchfab, then is definitely a step in the right direction.